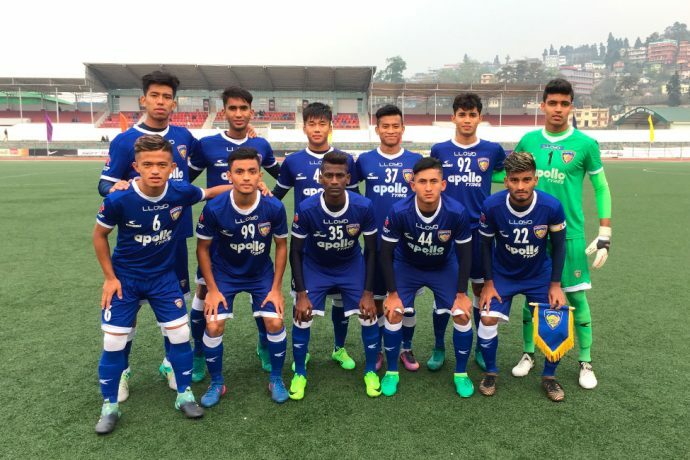 The Chennaiyin FC ‘B’ team began its Second Division League campaign with a 2-1 loss to Langsning FC at the Jawaharlal Nehru Stadium in Shillong today. Trailing by a goal at the break, CFC ‘B’ with a starting eleven and 18-man squad whose average age is a mere 18 years, fought back courtesy skipper Prosenjit Chakraborty’s brilliant free kick but fell behind in the closing stages to finish their first game in defeat. This match was the CFC ‘B’ team’s first competitive outing after having made their debut bow in the Don Bosco Fr. McFerran Trophy in Chennai earlier this year. This was a completely different proposition for the Chennaiyin starlets, facing Langsning FC in the Second Division League. And the boys in blue gave a good account of themselves at both ends of the field in what was a challenging afternoon in chilly conditions. The side from Shillong got off to a bright start and made inroads from the flanks. But the CFC ‘B’ defence along with goalkeeper Samik Mitra held firm to deny Langsning in the opening exchanges. The home team however took the lead on 25 minutes when defender Lancine Toure rose the highest to head home. Langsning continued to attack after the goal but Samik made some vital saves to keep the score 1-0 at the break. Chennaiyin began the second half brightly, pressuring Langsning in their own half. Striker Aman Chetri missed a decent chance to level on 50 minutes when he fired wide from a Prosenjit free-kick into the area. And just past the hour mark, Chennaiyin made the pressure tell when Prosenjit made it 1-1 with a well-taken free kick from 18 yards after Chetri was felled outside the area. Prosenjit and substitute Joysana Singh then had two glorious chances to give CFC the lead, but they spurned their efforts after Bedashwor Singh had put them through on both occasions. Just as the match was heading for a draw, Langsning took the lead in the closing stages. Kitboklang Pale connected with a cross from the right flank and found the back of the net on 83 minutes. Joysana had yet another opportunity in the dying stages but his effort went straight to the Langsning keeper as the referee blew the final whistle. Chennaiyin ‘B’ thus tasted defeat in their Second Division League opener, but will be looking to turn things around when they take on Mohammedan Sporting in their next game on March 17th, 2018 at the Barasat Stadium in Kolkata.